The M25 (as well as several other 8870 models) used SMC (Streamer Mode Cassette) drives for system backups and restores. If you look at how an SMC actually works, it's amazing that they work at all. The design, IMHO is terrible and the cassette tapes don't age well. I'm sure the terrible design was to keep costs down and make the drive mechanics simpler. Whilst Nixdorf used to buy in the drives so it's not their fault about their longevity, I do wish they had used something else. Then again, the larger Cipher mag. tape drives weren't any better. Anyway, the SMC drive needs to be serviced fairly regularly. If you are luck to find an SMC cleaning cassette then this is going to be a really easy job - put it in and follow the instructions; oh, and tell me where you bought it from as I want one, however, it's more likely you are going to have to clean the drive by hand. 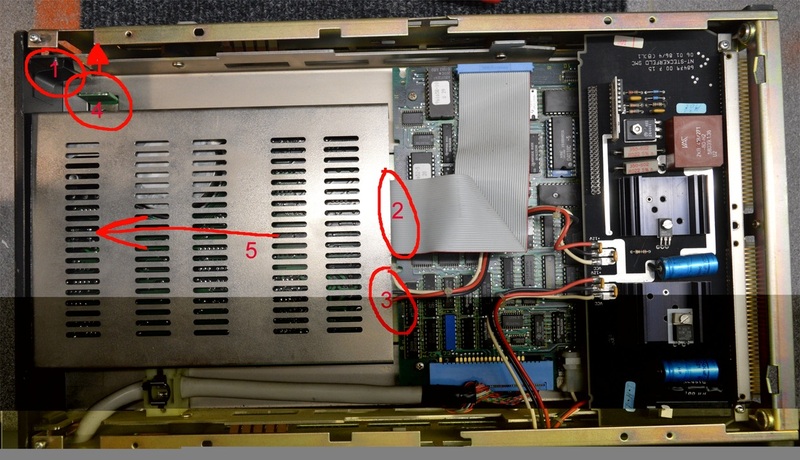 First job, disconnect the top cable from the 2549-01 controller plate and also make sure that the retaining screw (accessed via a hole in the back-plane behind the SMC drive) is released. Pull the unit and lay it down on a flat surface. 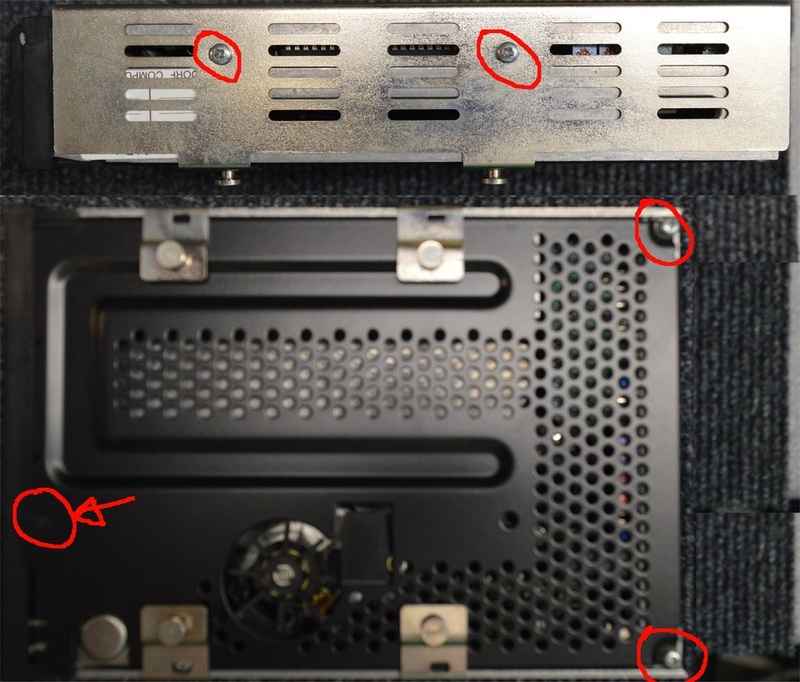 There are two No.10 TORX screws in the top and bottom left corners that need to be removed. Next you can slide the top off to the left; it may keep getting stuck on the black front panel (if the panel is actually there). Yes, it's possible to get away with just loosening those two screws, but save yourself a headache and just remove them. Next step is to remove the drive from the main case. There are 5 steps you need to follow and the picture below shows the steps and the order. 1. Remove the from black metal panel. 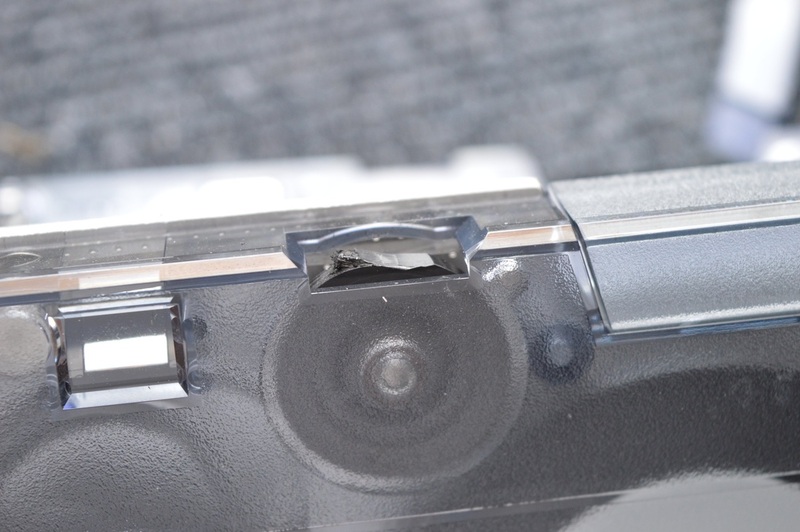 There is a spring clip that you can gently bend and the top of the panel will then hinge forward. 4. This is the drive locking catch and it MUST be slid upwards to release the drive. 5. It's a tight fit, but you can now slide the drive to the left freeing it from the main chassis. You may have to use a fair bit of force. Make sure that you have done step 4 before you try. If in doubt, close the catch and then release it again just to make sure. Before looking at the main drive unit, look around inside the chasses and gently remove any dust, fluff or other debris you can see. Dust is a killer to these drives and the cleaner the chassis, the better the drive behaves. If you have access to a compressed air duster then this is great at getting the majority of the dust out. An outside job if you've never done this before; trust me. Next, onto servicing the actual drive unit. 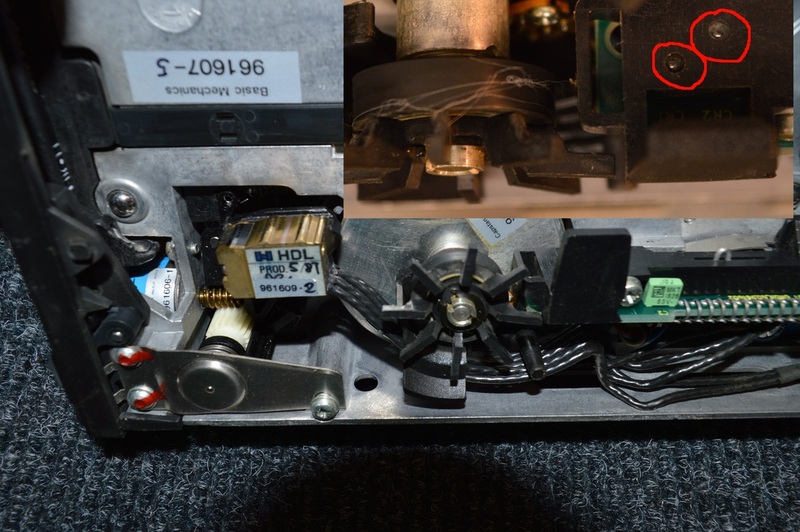 On each side of the drive unit there are two screws that need to be removed. This will allow you to slide the actual drive out of it's mounting cage. Underneath the drive there are two screws located in the corners. Remove these and then lift the black plate up from the back. Gently slide it to the right. There is a little lug (ringed on the picture below) that you may need to press down with a screwdriver blade. There are three parts of the drive that need to be cleaned. You should also remove any other dust or debris you see. I use pre-injection wipes for cleaning tape drives. They are individually sealed packets, that contain a little piece of material soaked in isopropyl alcohol. You can usually find these on eBay in boxes of 100 for peanuts. Clean the head first and in both directions (left/right and up/down). The surface of the head should be bright and shiny afterwards. If you can see dirt on the wipe after cleaning, use a fresh wipe and clean the head again. Next clean the optical sensor. 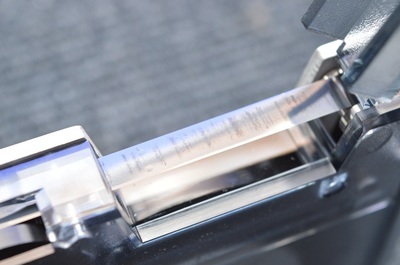 The optical sensor consists of an infra-red LED and receiver and is shone onto the little mirror mounted within each data cassette. If the sensor is dirty the drive won't detect the start and end-of-tape correctly and will probably end up destroying the tape. The good news is that these drives don't have a drive belt to perish. 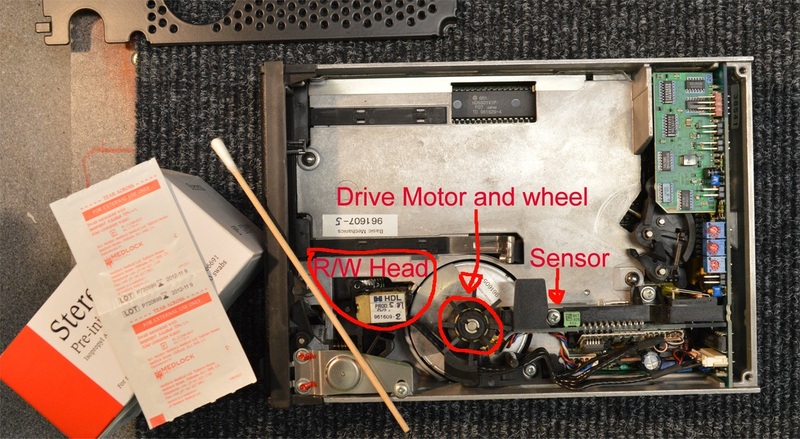 The bad news is they have a little rubber wheel connected directly to the drive motor that perishes instead. 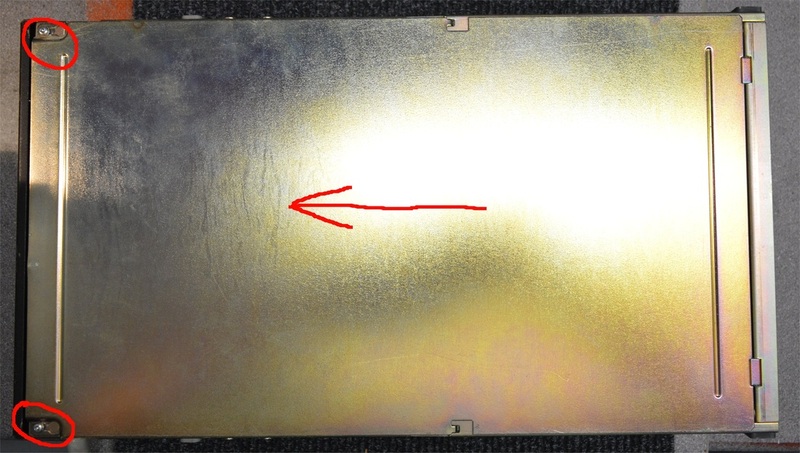 If your drive is chewing or damaging tapes, it's probably this wheel that's giving problems. The picture above was taken when I first received my system. You can see there is a piece of cotton wrapped around the wheel. ANYTHING on that wheel will damage your tapes. A badly maintained drive, or one that has a perished capstan wheel is going to damage your tapes. The pictures below were both caused by a perished rubber wheel. Using a clean wipe, gently clean the rubber wheel. I use the wooden handle from a cotton-bud to hold the wipe over the rubber wheel whilst slowly rotating the wheel - the fan attached to the top is ideal for this. If the wipe looks dirty, clean, and clean again. If the wipe looks like it's got black rubbery tar being deposited and you don't seem to be able to get the wheel clean, the rubber has probably perished and you've got a serious problem on your hands. That's it. Put everything back together and hopefully it will work.